When I read tarot cards, whether in-person or for my awesome Tarot Stella or Solstice Star clients, I often feel like I am not so much interpreting the cards as I am eavesdropping on their conversation between one another. For me, the tarot deck is a living book of wisdom that is constantly moving and shifting parts, telling new stories, and uncovering old paths. Some cards are more talkative than others, but when they are cast in a spread they begin to talk amongst themselves about the question presented to them. "The pain of this heartbreak is real and cannot be ignored any longer, no matter how many times we are told to 'get over it,'" says the Three of Swords. "I know," nods the Eight of Swords, "it has led to us to being trapped by our own thoughts and ensorcelled by our feelings. Everything feels darkened now, hopeless and unsteady." "But the fire of love is not gone," the Three of Wands gestures to a vast landscape of possibility. "It has simply moved. Elsewhere and unseen at the moment, but not truly lost." In my class on card casting and creating custom spreads, we talk about the importance of the question. The question helps to set up the space for the conversation that the cards can have. Sometimes when we get confusing cards in our spread that seem to make little sense given our question, it's not that the cards are wrong or our ability to interpret them is lacking (though, sometimes the cards are cleverer than us and it is important to continue to cultivate a student's mind throughout your work with divination), but that the question did not allow for the answer to come through. There is also the actual structure of the spread to consider when seeking information and insight. If you imagine, for example, each card in your spread to be a chair at the dinner table, what cards do you want to be close enough to each other so that they are able to talk without yelling from one end of the table to the other? In other words, what are the conversations you wish you could be having in order to gain further insight and how can you bring this to play in your spread. It was in the spirit of experimentation and trying to recreate the complexity of conversations between multiple parties (whether the inquiry is along the lines of a she said / they said question or a question from our conscious mind to our subconscious mind or having a chat with our future self), I came up with the idea of a spread of moving pieces or The Triangulation Spread. While I very much enjoy simple spreads, there is plenty of space in my practice for stretching my divinatory muscles with a more complex piece of casting that I'm about to describe with the Triangulation Spread. Yet, what is fun about the spread is that it can be as simple or complex as you like and you can decide that as you go along as opposed to ahead of time giving the reader greater flexibility in gleaning knowledge from the cards. How can I focus my creative passion into a sustainable career? All cards shown in this post are from the World Spirit Tarot. Since our querent has many passions, the first triangle is one of self with a focus on the querent's strengths in order to help them figure out what passions may be best turned into a career path. The first triangle is the foundation stone of the spread - these cards will not move but will still interact with the other cards pulled which will be explained as we go along. For their triangle of self, the querent pulled the the Sibyl (or Queen) of Swords, the Two of Wands, and the Ten of Wands (inverted). I've given some brief interpretations as a full interpretation of this spread would be a long post indeed! The Sibyl of Swords crowns the triangle and speaks to the querent's underlying theme of storytelling in all that they do as well as a maturity to their craft . The Two of Wands both represents the querent's ability to help others find hope and possibility through telling their stories and re-membering (literally, putting back together) who they are as well the possibilities ahead of the querent in regards to turning their passion into a career. The inverted Ten of Wands recognizes the querent's overwhelm at having so many interests, which has left them feeling stuck and burdened, but since it is inverted the energy is diluted and there is a recognition that the querent is focusing their creative fire (as represented by the wands) as opposed to being completely overrun by it. The Ten of Wands is a reminder for the querent to continue to understand their own story and to own it as part of their work of discovering the path ahead of them. The next three cards make up the triangle of chrysalis which gives specific insight to help the querent begin to transform their passion into a career. The three cards of the triangle of chrysalis are the Seven of Pentacles, the Five of Pentacles, and the Hanged Man which overlay the last three cards of the triangle of self. First, we look at the conversations happening between the Sibyl of Swords and the Seven of Pentacles (it's time to actually harvest what you've grown with all of the hard work you've already put in - you're not starting from ground zero even if it feels like it at the moment), the Two of Wands and the Five of Pentacles (it is difficult to help others find possibility and hope if the querent has a limited vision of possibilities about their own success and feel that they are in a permanent state of scarcity), and the Ten of Wands and the Hanged Man (the Hanged Man recommends that the querent transforms the feeling of stagnant stuckness to focused stillness in order to understand that they have all the tools they need for the task ahead even though it requires them to sacrifice self-limiting beliefs and practices). Once the initial conversations have been listened to, move the cards clockwise the next position. So the Hanged Man sits with the Sibyl of Swords, the Seven of Pentacles states talking with the Two of Wands, and the Five of Pentacles strikes up a conversation with the Ten of Wands. Further insights can be gleaned now with the same cards in different positions. The Five of Pentacles, for example, reveals that part of the overwhelm experienced through the Ten of Wands is trying to figure out what passion will be most profitable which feels limiting and confusing to the querent. The cards are moved one final time to complete the circuit and have their third conversation, and then they are moved back to their original position before the final three cards of the last triangle is cast. The third triangle is one of action, recommending next steps for the querent to take on to create a sustainable career from their storytelling passion. The three cards pulled were the Seer (or Page) of Pentacles, the Three of Wands, and the Six of Wands. The Seer of Pentacles, especially in this deck, has a powerful air energy moving through it (see the creatures flying out of the tree above the head of the sitting person) and speaks to the Sibyl of Swords' ability to help guide folks through their reflective journey to finding their own stories and becoming grounded in their truth. The Seer of Pentacles serves as an affirmation that the path of the storyteller will not only be a prosperous and sustainable one for the querent (since Pentacles are a suit of security, abundance, and long-term planning), but the card also illustrates the type of work environment that the querent can create in order to be successful. The Seer of Pentacles is also speaking with the Seven of Pentacles and, in fact, represents the harvest illustrated in the Seven of Pentacles. The Three of Wands is a great continuation of the conversation started by the Two of Wands and continued with the Five of Pentacles - it shows what the cultivation of hope and the exploration of the querent's money and success story can do when it comes to expanding their prospects. The Six of Wands shows the transformation of the figure in the Ten of Wands into the Hanged Man and finally returning home again to community that wants and needs their skills and insights. The Six of Wands reminds the querent that they have a vast support network that they need to tap into when it comes to promoting themselves and developing their business. Again, as with the triangle of chrysalis, these last three cards move around the spread conversing with new cards, gleaning more insight into steps to take for the path ahead. You can move the cards in the triangle of chrysalis again, too, if you like. Imagine the conversation that could be had between the Sibyl of Swords, the Five of Pentacles, and the Six of Wands about clearing out a scarcity complex as part of the work of bringing together community. What I like about the moving parts of the Triangulation Spread is the fact that it reflects the complexity of the shifting parts of our lives. Moving the cards around can be helpful when a querent feels stuck in one place and has no clue how they're supposed to get to a hopeful card that has shown up later in the spread. The act of physically moving these cards together (which is a play on traditional spellwork in which components of the spell are moved closer and closer together to attract a certain outcome) can be such a simple act but still provide a surprising amount of revelation. As you can imagine, there are many ways to ask questions and shift cards within the context of a Triangulation Spread - I hope you have fun experimenting and share your experiences in the comments below or by using the hashtag #TriangulationSpread in your various feeds (I'm on instagram most often if you're looking to chat). Need more tarot in your life? Come this way! I like reading poetry, I like writing poetry, and I have memorized more than one poem as part of my devotional practice, dispensing them like blessings throughout my day. It is incredible how a simple collection of words, ordered in an uncanny or fantastically simple way, can spin open a heart whether written by someone last week or a thousand years ago. I think that Tarot is a poetic art and inspires us to get honey-tongued with our interpretations so that we might illuminate our depths and help others do the same. The ordering of words in the art of Tarot could be seen as the choice or creation of a spread. Many a tarot reader (and herbalist) will tell you that it is less about what cards are cast (or what healing imbalances are readily observable) and more about what questions are asked (and not asked). It can be difficult to determine what questions will be the most appropriate and revelatory, but feeling inspired to form a foundation on which to cast our cards can help us spark to life the right questions for us to be asking. The journey with Tarot (and our plant kin) asks us to expand the playing field of possibility and our ability to interpret our surroundings and inner landscape with inquisitiveness, courage, and confidence. The patch of scraggly trees on the corner of your block can become a sacred grove when our perception is rearranged and so it is with poetry that every day words take on new depths of vulnerability and consequence when they are arranged in ways to break us open, pull us together, and help us feel something that normally such words would not inspire for us. If you haven't noticed yet at this point, I think the art of tarot and herbalism inform one another. Check out my free Tarot Herbal Wisdom series to learn more about the healing art of plant medicine and the power of casting cards. So, clever one, if you're looking to stretch your card spread creating muscles and find new ways of discovering wisdom-rich questions, I've created the following poetry-inspired activity for you! First, gather your deck of choice (it can be a Tarot or Oracle deck or similar divinatory tool that you can use with spreads), a pen, piece of paper, and a poem of choice. As an example, I've chosen the following short poem from the collection of the Zi Ye (or Songs of Ziye) which are poems and Chinese folk songs typically said to be written by women from the 6th - 3rd centuries BCE. Out of Nowhere, Nothing answered "yes." It's an intriguing poem, describing restlessness and yearning but great possibility. Who hasn't felt spiritually restless on their journey, staring into the dark and yearning for answers? So let's translate the wisdomspark of the poem into a Tarot spread. A description of my current state of spiritual restlessness. This first card acts like a mirror helping the querent understand what they are experiencing. The source of my spiritual restlessness. Just as the moonlight in the poem distracts them from sleep, we can find our own source of spiritual distraction. What messages are trying to get through that I am ignoring and/or confused by. In the poem there is a voice calling out from the great vastness of Nowhere and it is named as Nothing. What is calling out to the querent? Alternatively, you could ask What is preventing me from listening to my inner wisdom and/or the wisdom of my guides, God/dess/es, ancestors, etc? The card of possibilities. The impossibility of Nowhere becoming Nothing and saying "Yes" is the power of this poem so it feels appropriate to cast one card that allows for possibility and unexpectedness. That is just one way of interpreting the Zi Ye poem into a spread. If you've chosen a much longer poem where a line-by-line spread would prove cumbersome, you can still identify the overarching themes of the poem. Certain words or lines may stand out to you more than others - follow those to the questions you might ask. The following is a longer poem by Hadewijch II, an unidentified 13th century Christian female mystic (side note: my little witch-heart fell deeply in love with the writings of female Christian mystics in junior high school and I consider Hildegard von Bingen to a vastly important but too often unrecognized source of wisdom in the Traditional Western Herbalism lineage - let's change that). Her words make me think of an energetic combination of the Hanged One and Tower cards in the Major Arcana of the Tarot. For me, she describes something coming undone, chaotic but utterly still. What have I grown out of? or What is coming undone? What am I reaching for that is still coming into being? Another card you might pull at this point could be: How is what is still coming into being affecting me now? hat restricts me from reaching and needs to be released? Who is on this journey with me? or A message from my inner wisdom, guides, God/dess, ancestors, etc. The last question depends on your spiritual framework or the note you want to end the spread on. You might be seeking solidarity with what is coming into being and want to know who is along with the ride. Ok, ready to work with your own poem? Read through your chosen poem a few times, jotting down themes and reflections that come up for you. It may take a few rounds for the questions to emerge. Just write down whatever comes up for you - flow is better than restriction at this point. Once you feel like you've gathered enough themes from the poem, begin to transform those themes into questions. So, if longing is a theme of your poem you might ask "What am I longing for?" Arrange the questions into a spread and cast your cards. You might find that in your first casting that you find more nuance in the questions or even the ordering what is asked - the cards can be very helpful in letting us know that if there were to be cast just a little differently - and therefore opening up more space - that more insight might emerge. Play, be poetic, and experiment, clever ones! 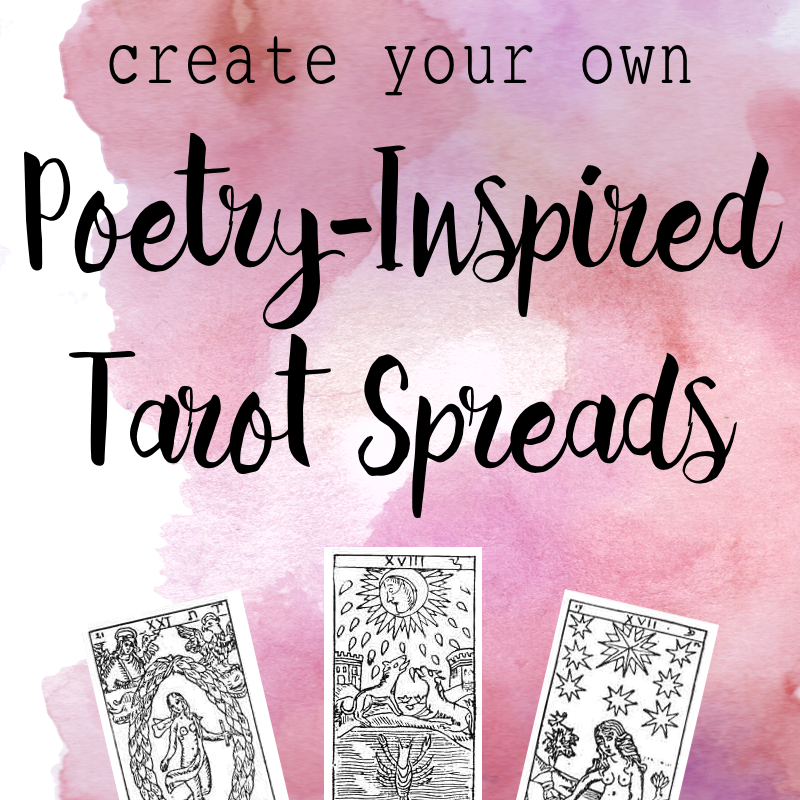 I hope that you are inspired to play with your own spread-skills having read through how I create poetry-inspired Tarot spreads. If you do end up creating a poetry-inspired tarot spread be sure to share your experiences and links in the comments. You can also use the #PoetryInspiredTarot to share your creations via social media (I hang out on instagram most often). Most of all, enjoy the process and happy spread creating! We respect your privacy and will not share your information with anyone including poets (no matter how good or bad their poetry may be). Thank you for signing up for Magick Mail! Once you confirm your subscription you'll be given access to our super secret member's only area!